MainAll NewsMiddle EastAbbas's Fatah Brags of Terror Attacks in Gaza Op. Abbas's Fatah Brags of Terror Attacks in Gaza Op. Abbas claims 17 times more 'martyrs' than Hamas in recent terror war, as Fatah video praises one of the dead, calls to continue attacks. As Palestinian Authority (PA) Chairman Mahmoud Abbas made the somewhat outlandish claim that his Fatah lost 17 times more members than Hamas in the recent Operation Protective Edge, Fatah praised one of its Gaza rocket commanders in a special video. A week ago Abbas said in a meeting in Cairo that Hamas only lost 50 terrorists, "while 861 Martyrs fell from Fatah," emphasizing that "Israel is responsible and it is the one attacking our people in the Gaza Strip," reports the official PA news agency WAFA as translated by Palestinian Media Watch (PMW). In a video on the official Fatah Facebook page two weeks ago, Abbas's faction praised its rocket commander Mohammed 'Al-Za'anin' of Beit Hanoun in northern Gaza. The terrorist of Fatah's Al-Aqsa Martyrs' Brigade was taken out by an IAF airstrike on August 26, "one hour" before the ceasefire agreement "as he was preparing to launch his final rocket barrage" on Israeli civilian centers, according to the video. The video, which was translated by PMW, opens with the Quran quote (Sura 3:169): "And never think of those who have been killed in the cause of Allah as dead. Rather, they are alive with their Lord, receiving provision." The Fatah terrorist is described as follows: "he carried a rifle, and bombarded the depths of the (Zionist) entity with rockets. He believed that armed resistance was the only way to liberate Palestine. (He) loved military activity. (He) inflicted pain on the occupation time after time." Closing the description, the Fatah narrator outdoes himself in glorifying the terrorist "martyr," saying "his pure body gathered up the earth, until his dignified soul rose to its creator. He sacrificed his soul for Palestine." The video also featured a song with such memorable lines as "fire RPGs (rocket propelled grenades), launch the KN rockets (mid-range rockets)...sow terror among the enemy's soldiers...launch your rockets, make the sons of Zion tremble and burn." While many world leaders have related to Abbas and his Fatah faction as a "moderate" alternative to Hamas, the new boastful video and claims by Abbas of inflated losses in Gaza reflect the ideology of terror held by his party. 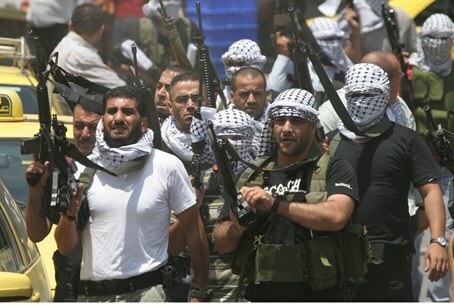 Senior Fatah officials have recently said they reached a "political decision" to support Arab terrorists "slaughtering" Jews living in Judea, Samaria and eastern Jerusalem, calling for a full return to terrorism, and declaring "open war" on the Jewish state. Such calls are in keeping with the Palestine Liberation Organization (PLO) charter of 1968, which declares "armed struggle is the only way to liberate Palestine." Following the charter, the PLO and Fatah were defined internationally as terror organizations, a status which was removed during the 1993 Oslo Accords process.